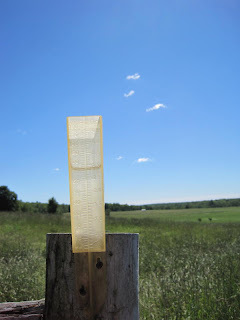 Almost 3 inches of rain fell on Wednesday just as it was getting hard to poke the fenceposts into the ground again. I'm beginning to believe that the drought really is over. We didn't suffer any storm damage, but just ten miles away my partner in our SARE chicken breed study lost 11 of her birds to the flooding on her low land. She went out to the fields on rescue missions each time the lightning abated, but the flood of water was just too much to be able to save all the chickens. I'm grateful that we sit on higher ground here.